The Division G final might be the biggest game of the Sweet 16. Sixth-ranked north is the only one of last year’s final four still standing, but they’re challenging #1 seed nicks on broadway in the tournament’s biggest division. This could be a call for another one of those progressive dinners, but nicks isn’t actually open on Tuesdays. 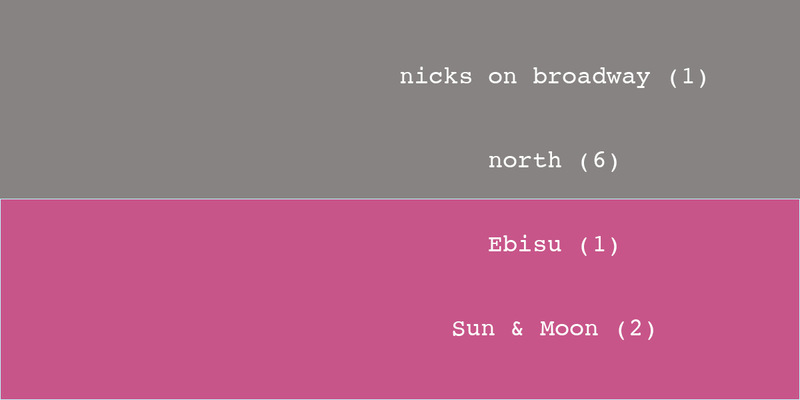 Meanwhile, the two top seeds in Division B square off in the Sweet 16: #1 Ebisu challenges #2 Sun & Moon. This one could be anybody’s game, although the Sun & Moon voters have been a little more vocal in the last two rounds about their team.